I love Keswick and I love Keswick more since discovering Kat’s Kitchen, Thursday of last week. 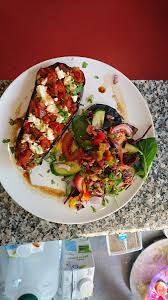 The food is unbelievably good and crunchy and nutritious and exciting and the kind of mouth happiness you should get every single day of your life…sadly I shan’t though, as I don’t live there…but maybe you do or you are holidaying nearby and are considering making an excellent dining choice. I spent two fabulous lunch dates on the top of a couple of mountain-hills eating a Falafel wrap with bonus salad, followed by the Gluten Free Carrot Cake at 3.00pm break-time (all dishes cunningly purchased as take-out prior to each day’s activities). 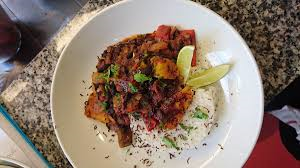 And I shared (well not exactly), an evening meal of Moroccan stew with lemon couscous and Stuffed Aubergine, which was so pleasurable no restraint was shown (or ability to share well), and I went to bed happy happy. Thankfully we all know vegetarian and vegan food is pretty much the bees knees, so I slept super well and woke refreshed, ready to track down my next mouthful.